Remember you want the fork to occacionally bottom out, but not too harshly nor too often. If you are bottoming out too often or not using all the available travel, and if the preload and sag feel good then the overall spriong rate should be changed. 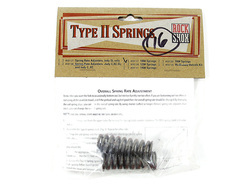 By changing the coil spring stops, you can alter the overall spring rate. By using shorter (softer) or longer (firmer) spring rate adjusters than stock, you can change the overall spring rate.